DR. APJ AKTU LUCKNOW NOIDA REGION: Odd / Even Semester Carry Over Examination for any subject in any session will be conducted in Dec 2016 for those students who pass final year is 2015-16 session for B.Tech, B.Pharm, MBA, MCA etc courses. 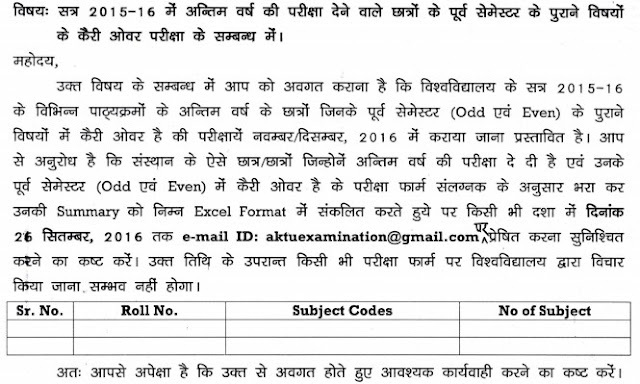 aktu.ac.in released a circular on 17 Sep 2016 on University official website with this carry over theory exam detail. Result is sent by post from 27 May 2017. Does students who pass final year in 2015 are also eligible for this? will there be any fees for filling these carry over forms ?? plz reply as soon as possible! My batch 2011-14 mca. I have pcp-a in final year marksheet and my 4th sem is not cleared because I had back in mca412 code (ijp) subject name... my career is about to finish. Plz share info regarding this. Is there is any fees per subject and when the 40grace rule will applied to result or it will not be applied its like joke. Clearly no...plz read circular again. You have to wait for few more days i think result will be published before 26 but dont take any risk fill the form on or before 23 sep with all of your subject as back. carry over paper jo may june me liye the university ne 2nd sem ke uska result kab declare karenge ye batao phle, bina result ke form kaise bhare ,kisis ko pta ho to reply kro kb result declare hoga 1st yr ka ,bhot hi dheeli university h india m. lakho students ka future barbad kr ke rakh diya h .
Sir I have completed my b. Tech. In 2015. I have remaining 1 back paper in 1st year secured with 17 marks. Will I get grace mark of 13 number. Carry over result kab aayega 2 sem ka 2015-16 plz sir declare the result it request .